Eastern senior Blaise Facemyer (left) steals the ball and leads a fast break in front of Big Blacks Kyelar Morrow (2) and Braxton Yates (right), during the Eagles’ 72-62 victory on Tuesday in Tuppers Plains, Ohio. 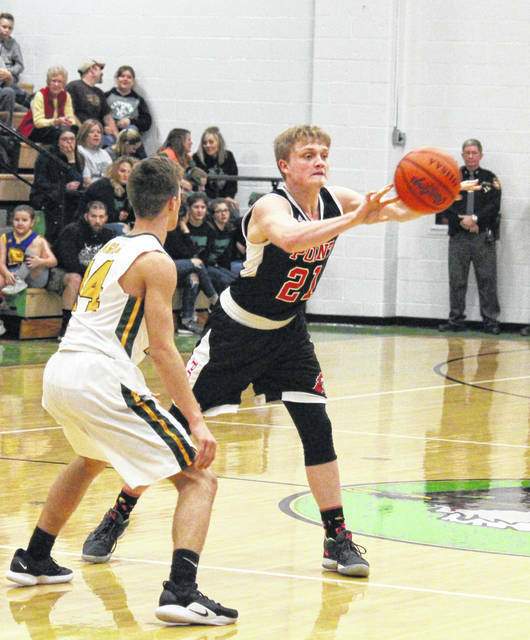 Point Pleasant senior Jordan Daubenmire (21) passes the ball to the left win, during the Big Blacks’ 10-point loss on Tuesday in Tuppers Plains, Ohio. TUPPERS PLAINS, Ohio — The Eagles won it inside the arc. 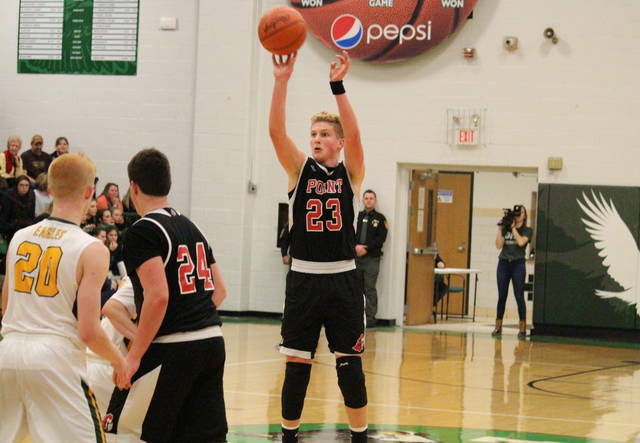 The Point Pleasant boys basketball team hit a dozen three-pointers in Tuesday’s non-conference bout in Meigs County, but host Eastern won the rebounding battle by 22 and hit 24-of-38 two-pointers en route to a 72-62 victory. Point Pleasant (2-10) — which has now dropped four consecutive decisions — led twice in the game, at 3-0 and 9-7 in the opening four minutes of play. 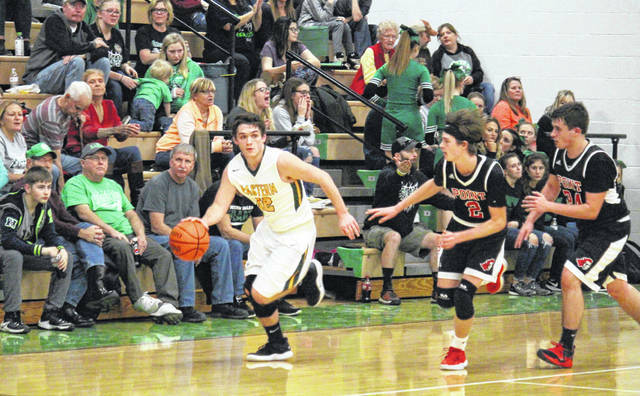 Eastern (8-5) — snapping a two-game skid — took its second lead of the game on a Ryan Dill three-pointer near the midway point of the first quarter, and the EHS advantage was stretched to five points, at 14-9, by the 2:30 mark of stanza. The Big Blacks tied the game at 16, but a traditional three-point play by Garrett Barringer gave EHS a 19-16 edge at the end of the first. The Eagles scored the first four points of the second quarter, but an 8-to-2 PPHS run made it a one point EHS lead, at 25-24. The teams exchanged three-pointers, and then two-pointers, before Eastern ended the half with a 6-0 run and a 36-29 lead. Point Pleasant outscored Eastern by an 11-to-9 clip in the opening 3:40 of the second half, making the Eagle lead 45-40 with 4:20 left in the third. The Eagles ended the period with a 7-to-3 run, however, and headed into the finale with a 52-43 advantage. The Big Blacks were back within five after their own 7-to-3 run over the first 2:15 fourth quarter. Each team scored four points over the next two minutes, making the EHS lead 59-54 with 3:45 to play. The hosts claimed the next six points, before a 8-to-4 spurt by PPHS made the EHS lead 69-62 with a minute to play. The Eagles capped off the victory by hitting 3-of-4 free throws in the final minute. Following the triumph, EHS head coach David Kight talked about his team rebounding from a pair of two-point setbacks last week. PPHS head coach Josh Williams acknowledged that the the Eagles’ length was a deciding factor in the game. For the game, Eastern shot 29-of-50 (58 percent) from the field, including 5-of-12 (41.7 percent) from three-point range, while the Big Blacks were 22-of-59 (37.3 percent) from the field, including 12-of-28 (42.9 percent) from beyond the arc. At the free throw line, EHS was 9-of-14 (64.3 percent) and PPHS was 6-of-7 (85.7 percent). 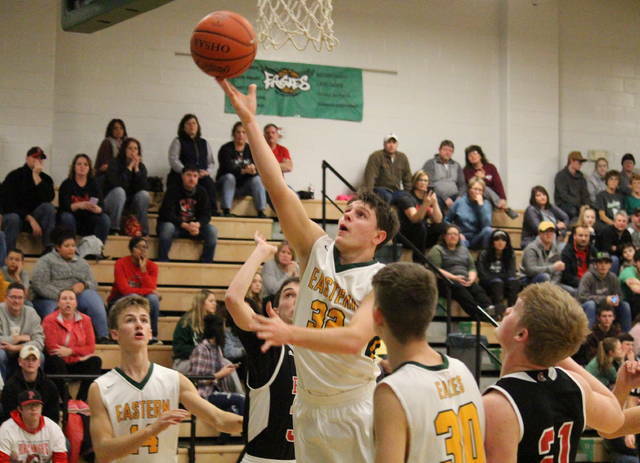 The Eagles outrebounded PPHS by a 37-to-15 count, including 11-to-6 on the offensive end. The Big Blacks claimed the turnover edge after committing 13 and forcing 19. Eastern came up with 22 assists, six steals and a pair of rejections, while the guests collected 15 steals and 14 assists. A quartet of Eagles finished in double figures, led by Barringer with 26 points on the strength of 10 field goals. Barringer also led a balanced rebounding attack for EHS, pulling eight boards, with four other Eagles grabbing at least five. Dill made a team-best four three-pointers and finished with 14 points, Mason Dishong added 12 points and seven rebounds, while Isaiah Fish ended with 11 points. Colton Reynolds contributed six points to the winning cause, Sharp Facemyer added three, while Blaise Facemyer had a game-best seven assists. Blaise Facemyer and Sharp Facemyer had two steals apiece to lead the EHS defense, while Barringer and Dishong each blocked a shot. Leading the Big Blacks, Braxton Yates had 22 points, 12 from long range, to go with seven steals, four rebounds and three assists. Hunter Bush made a trio of trifectas and ended with 21 points, while Kyelar Morrow had 12 points and three assists in the setback. Rounding out the PPHS total, Aiden Sang scored three points, while Jovone Johnson and Jordan Daubenmire marked two each. Eastern gets back to work in the Tri-Valley Conference Hocking Division at home on Friday against Miller. The Big Blacks will be back in action at home on Saturday against James Monroe.